Representing the Ultimate in design, functionality, security & longevity the Silca Impero Ultimate Frame Pump is the choice of riders who want nothing but perfection on every ride. Steeped in history the new Silca Impero Ultimate Frame Pump is a culmination of merging high-tech modern materials and manufacturing with the full aluminum construction and durability that was a hallmark of the original 1920's Impero. Featuring FlexWing Technology the Silca Impero Ultimate Frame Pump will fit tube sizes between 1" (25mm) and 2.5" (60mm) including aero frames with the use of a frame strap. The Impero Ultimate also fits frames with a pump hook, as the handle end has a small insert hole. Whilst fitting into the frame the Impero Ultimate uses Silicone Bumpers to fit securely and provides Ultimate paint protection throughout each ride. The Silca Impero Ultimate Frame Pump possesses the most efficient inflation of any portable pump on the market. The Impero Ultimate makes roadside inflation even easier with the use of its 2 stage Sealing Advanced Elastomer Head meaning there is no lever fuss to mess around with. If you want a functional pump that provides the most pleasing esthetic of any on the market the Impero Ultimate is well the Ultimate. Nothing beats it. 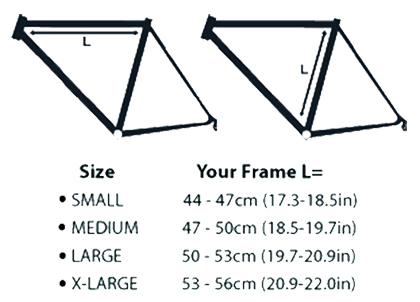 Please note: sizing below is NOT frame size, this is the measurement between tubes. Please view the fitting video if you are unsure or contact the Wiggle team.